The New York Fed sponsors technical assistance workshops for small businesses on traditional lending, alternative and emerging sources of capital, and export financing. The New York Fed, New York State Empire State Development, and the Long Island Food Council are co-sponsoring a workshop for food, beverage and agricultural enterprises interested in learning about traditional and alternative sources of financing and procurement strategies. Attendees will hear from lenders on a wide range of topics, including which types of financing are most appropriate for their needs, what lenders look for in potential borrowers, alternatives to traditional bank loans, tips on improving their chances for success and available procurement opportunities. There will be a resource expo held after the workshop. The New York Fed, New York State Empire State Development, New York State Department of Agriculture & Markets, and Hudson Valley Agribusiness Development Corporation are co-sponsoring a workshop for food, beverage and agricultural enterprises interested in learning about traditional and alternative sources of financing and exporting strategies. Attendees will hear from lenders on a wide range of topics, including which types of financing are most appropriate for their needs, what lenders look for in potential borrowers, alternatives to traditional bank loans, tips on improving their chances for success and available opportunities and financing tools for expansion to international markets. There will be a resource expo held after the workshop. Recognizing that firms that make, process, and sell agricultural products play an important role in the state’s economy, the New York Fed recently held a conference for NY food and beverage firms on accessing capital, co-sponsored by Empire State Development and the New York State Department of Agriculture and Markets. The goal of the event, which was held on June 24, was to provide information about the wide array of financing available for these firms, and to help them decide which types of financing would best suit their credit needs. The conference also highlighted opportunities in international markets, and identified financing tools available to assist firms with exporting their goods abroad. The New York Fed, Office of the Brooklyn Borough President Eric L. Adams, Brooklyn Chamber of Commerce and Operation HOPE Inc. co-sponsored a technical assistance workshop for small businesses interested in learning about alternative and emerging sources of financing. Attendees heard from lenders and experts on topics, such as crowdfunding basics, how lenders assess borrowers’ credit worthiness, online lending platforms, revolving loan funds and community development financial institutions. Lawrence Baber Jr., Small Business Program Manager, HOPE Coalition America (Division of) Operation HOPE Inc. The Federal Reserve Bank of New York, Bronx Overall Economic Development Corporation, the Business Initiative Corporation of New York and the Small Business Development Center-Lehman College co-sponsored a technical assistance workshop for small businesses interested in learning about traditional and alternative sources of financing. Attendees heard from lenders on a wide range of topics, including which types of financing are most appropriate for their needs, what lenders look for in potential borrowers, alternatives to traditional bank loans and tips on improving their chances for success. There was a resource expo held after the workshop. Read speaker bios for this event. Attendees heard from lenders on a wide range of topics, including which types of financing are most appropriate for their needs, what lenders look for in potential borrowers, alternatives to traditional bank loans, and tips on improving their chances for success. There was a resource expo held after the workshop. Download speaker bios and contact information as well as expo participant contact information for this event. The New York Fed and Business Council of Fairfield County in partnership with the Connecticut Small Business Development Center, Connecticut Technology Council, Connecticut Women's Business Development Center and Ferguson Library co-sponsored a technical assistance workshop for small businesses interested in learning about non-traditional sources of financing. $30 registration fee covers the share incurred by the Business Council of Fairfield County. Peyman Zamani, CEO, Logicbroker, Inc.
Bret Bader, CEO, Owlstone, Inc.
Download speaker bios for this event. The New York Fed and U.S. Small Business Administration co-sponsored a conference for food, beverage, and agricultural enterprises in Upstate New York interested in learning about traditional and alternative sources of financing. Attendees heard from lenders on a wide range of topics, including which types of financing are most appropriate for their needs, what lenders look for in potential borrowers, alternatives to traditional bank loans, tips on improving their chances for success, and available opportunities and financing tools for expansion to international markets. There was a resource expo held after the workshop. Gregory Smith, Regional Director-Eastern Region, Export-Import Bank of the U.S.
Download speaker bios and contact information for this event. The New York Fed and the New Jersey Institute of Technology (NJIT) School of Management, in partnership with the NJIT Enterprise Development Center (EDC), NJIT Innovation Acceleration Center, Greater Newark Enterprises Corporation, and Atlantic Federal Credit Union co-sponsored a technical assistance workshop for small businesses interested in learning about non-traditional sources of financing. Moderator: Hari Ganapathy, Vice President of Business Development, Dun & Bradstreet Credibility Corp. The New York Fed, New York State Empire State Development, New York State Department of Agriculture & Markets and Mohawk Valley Edge will co-sponsor a workshop for food, beverage, and agricultural enterprises in upstate New York interested in learning about traditional and alternative sources of financing and exporting strategies. The New York Fed, NYS Empire State Development and Long Island Development Corporation co-sponsored a workshop for food, beverage and agricultural enterprises on Long Island interested in learning about traditional and alternative sources of financing and exporting strategies. Attendees heard from lenders on a wide range of topics, including which types of financing are most appropriate for their needs, what lenders look for in potential borrowers, alternatives to traditional bank loans, tips on improving their chances for success and available opportunities and financing tools for expansion to international markets. There was a resource expo held after the workshop. The New York Fed, NYS Empire State Development, NYS Department of Agriculture & Markets and New York Wine and Grape Foundation co-sponsored a workshop for food, beverage and agricultural enterprises in the Finger Lakes region interested in learning about traditional and alternative sources of financing and exporting strategies. JERSEY CITY: STAGES OF BORROWING—WHERE TO GO AND WHEN? The New York Fed and Federal Deposit Insurance Corporation will co-sponsor an evening workshop for small businesses in Jersey City, New Jersey, interested in learning about sources of financing as well as the process of borrowing. Attendees will hear from lenders and experts on the many stages of borrowing and learn where to go and when. There will be a resource expo held after the workshop. 8:10pm Stages of Borrowing—Where to Go and When? The New York Fed, State University of New York, Operation Hope, GreenPath Financial Wellness, Access Latina and FindSpark co-sponsored a free, half-day event for rising and aspiring entrepreneurs. Experts guided attendees through conquering student loan debt, creating a business plan, accessing capital and marketing through social media. Representatives from RocketHub, Happy Mango, Kiva Zip, GreenPath Inc., Operation Hope and the Minority Business Development Institute attended. 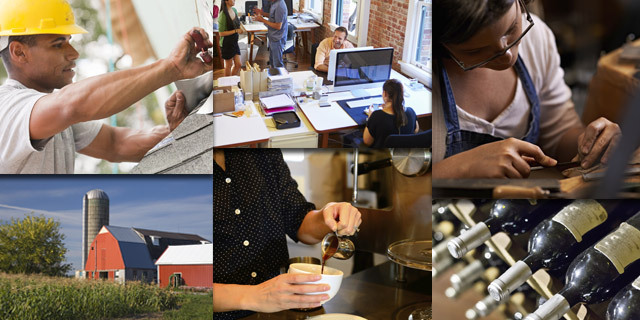 The New York Fed is co-sponsoring an event for small businesses with the nonprofit Pathstone Inc. Attendees will learn about the different ways small businesses can access capital on the Island as well as how to export goods and services. Representatives from USDA Rural Development, Export-Import Bank, U.S. Commercial Service, Puerto Rico Export Company and Puerto Rico Farm Credit are scheduled to attend. Javier Zapata, Deputy Director, Economic Development Director for Puerto Rico, Pathstone, Inc.
Javier E. Zapata Rodriguez, Deputy Director, PathStone, Inc.
Descarga el programa y el anuncio para este foro. The New York Fed, New York State Empire State Development, New York State Department of Agriculture & Markets and the Small Business Development Center at Niagara County Community College are co-sponsoring a workshop for food, beverage and agricultural enterprises interested in learning about traditional and alternative sources of financing and exporting strategies. Bill Vogt, Director of Housing and Community Development Services, Chautauqua Opportunities for Development Inc. The New York Fed, New York State Empire State Development, and the New York State Department of Agriculture & Markets are co-sponsoring a workshop for food, beverage and agricultural enterprises interested in learning about traditional and alternative sources of financing and exporting strategies.